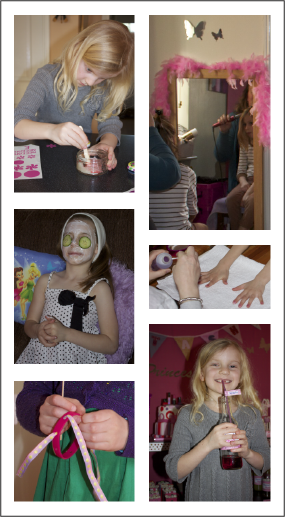 This year, for her 7th birthday, my daughter decided she wanted to have a girly pamper party. Once we decided on a pink, purple, red and white colour scheme, the fun began. The cake, of course, was the most important element to start with. I went with 2 layers, one vanilla and one dark chocolate, with vanilla buttercream icing and fondant. Lots and lots of fondant! 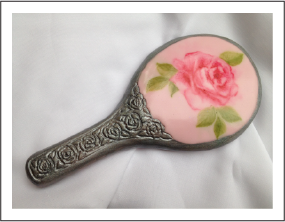 I think my favourite element has to be the hand mirror. Then I got this mad idea to put jelly (jello) into the centre of the vanilla cake. I remember seeing someone do something similar on a blog somewhere, and thought it looked like jewels, so I thought I would give it a shot. It worked well and added a real WOW factor when the cake was cut. 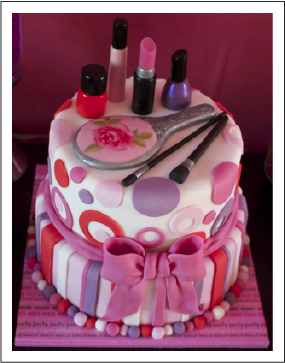 But of course, I couldn't JUST do cake, could I? So I made iced cookies and cake pops too (they are, after all, an excellent use for all the cut offs from the cake). These were complimented with glass jars and dishes filled with candy, piles of fruit and veggies, cocktail sausages, cheese and biscuits, marshmallow lollipops, popcorn and candy floss. Next came the decorations. 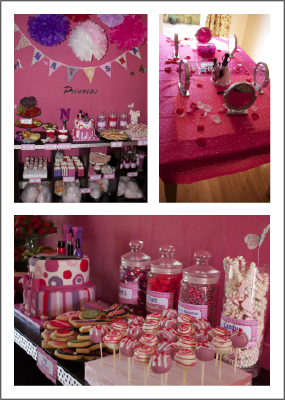 I made lots of big tissue paper pom pom flowers (with plenty of help from my son), bunting, labels and popcorn boxes and then lavished the area with ribbons, feather boas, throw cushions, rose petals and other little details. 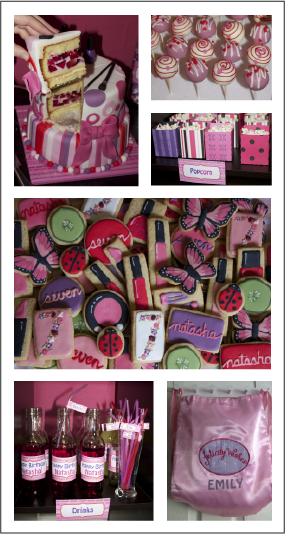 Each girl would get a personalised pink satin party bag, stuffed with goodies, to take home. So, what did they do at the party? They made their own lip gloss, enjoyed a facial, had their hair styled, got their nails painted, made friendship bracelets, bejeweld a personalised make-up mirror and made up their faces. Oh, and ate plenty of candy! Thanks to some wonderful friends who gave up their afternoon to help me run it all, the girls had a fantastic time.